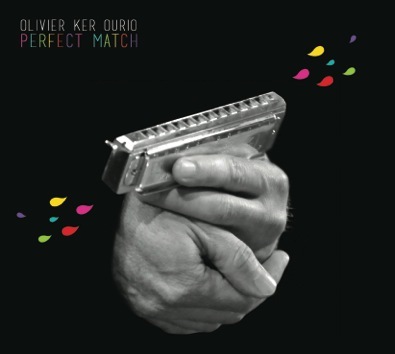 Paris-based musician, composer, band leader, and highly-regarded soloist, Olivier Ker Ourio has established himself as one of the world’s premiere chromatic jazz harmonica players. Acclaimed by critics as the true inheritor of Toots Thielemans, OKO is a highly demanded soloist (Sylvain Luc, Marcel Azzola, Michel Legrand, Didier Lockwood, Danyel Waro, Ralph Towner…) as much as a great composer and project leader. In his eight albums recorded as a leader, his compositions combine lyric melodies with invigorating rhythms and inventive harmonies. Emotionally expressive, warm and inviting, Ker Ourio’s music is committed, fresh, and melodic — and above all, straight from the heart. His new album “Perfect Match” , recorded in 2013 with ideal companions like Emmanuel Bex (hammond organ), Matthieu Chazarenc (drums) & Nicolas Moucazambo ‘percussions) will be released early 2014. Ker Ourio was born in Paris in 1964, but grew up in his family’s homeland: the small French territory of Reunion Island, where his ancestors from Brittany came to settle in 1728. When he was only eight years old, his father handed him a chromatic harmonica. At first a toy, it eventually became the instrument of his life’s passion. At 20, Ker Ourio returned to France to study computer programming, in Grenoble. Fortunately, his harmonica accompanied him, and it’s here that his story truly begins — with the discovery of his love for jazz, and his first amateur concerts. Returning to Reunion Island, he studies under François Jeanneau at the National Conservatory of Music, forms his first group and plays extensively in clubs and festivals on the island. He opens for renowned singer Dee Dee Bridgewater. Then in 1992, he moves back to France permanently to pursue jazz full-time. One year later, with vibraphonist David Patrois, Laurent Camuzat, Olivier Le Goas, a milestone: he wins both the soloist and orchestral categories at the National Jazz Competition of La Défense and is later featured in the Paris Jazz Festival at Radio France. Concert and television appearances follow. 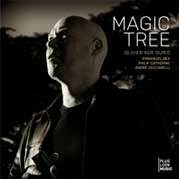 He plays throughout Europe and embarks on an extended tour of Russia with the group InterJazz. In 1994, Ker Ourio meets and performs with pianist Michel Petrucciani in concerts and on national radio. He also meets drummer Aldo Romano and records on his album Prosodie with Paolo Fresu, Stefano di Battista, Franco d’Andrea, and Furio di Castri. He also wins the “Fondation de la Vocation” award. In 1995, it’s another move — this time to New York — to search out the true source of the American form. 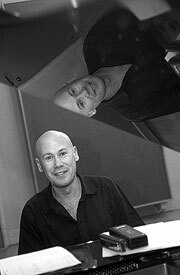 While studying composition with pianist Franck Amsallem, he plays as a sideman with a number of celebrated musicians and is featured on vibraphonist Joe Locke’s Sound Tracks, with Rufus Reid and Gene Jackson, for Fantasy Records. Returning to Paris, Ker Ourio widens his musical palette and collaborates with many musicians, including Denis Leloup, Tony Rabeson, Pierrick Hardy, Gildas Boclé and Pierre de Bethmann (of Prysm). In 1999, he brings them together to record his second offering: Oté l’ancêtre! (Hey, Ancestor!). The groove is an exceptional blend of jazz and maloya rhythms — and a musical rejoinder to his island roots and his ancestral Celtic heritage. In 2002, Ker Ourio organizes an artistic residence on Reunion Island, with the goal of creating a new fusion: jazz and Creole music. He forms a collaboration with the island’s legendary maloya vocalist, Danyel Waro. Together with the quartet, he records a fourth album, Sominnkér (Path of the Heart). The eleven tracks represent a rare blend of poetry, world music and jazz. 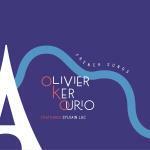 The album wins praise from the press, and a still wider audience for Ker Ourio’s music. “The album’s title says it all – on this Sominnkér, or Path of the Heart, Olivier Ker Ourio returns to his roots, investing the music of his homeland Reunion Island with his own unique vision and talent. For his first album as leader to include lyrics, Ker Ourio offers us a recording of his explosive encounter with Reunion Island’s Danyel Waro, “the Voice” of Creole maloya. An invigorating mix of jazz and world music, this album will surprise you with its magical music, powerful lyrics and emotional intensity. 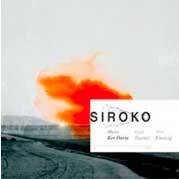 SIROKO (2005) marks a return to a more intimate music. Released in Spring 2005, Siroko is a unique collaboration with renowned American guitarist Ralph Towner (composer and co-founder of the American group Oregon) and Swiss bassist Heiri Kaenzig (co-founder of The Vienna Art Orchestra). The resulting sound marks a new direction — at times lyric, with intricate harmonies and melodic lines; at other times energetic, using acoustic bass and guitar to achieve a driving rhythm without the use of drums. Throughout, Ker Ourio’s harmonica weaves and dances like a sirocco — the hot, migratory, orange-colored wind that originates in North Africa and crosses the Mediterranean into Europe. 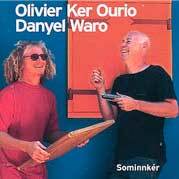 In 2007, Ker Ourio signs with DREYFUS JAZZ label, with album OVERSEA. “In the family of wind instruments, there is a brotherhood of the highly gifted, blessed by the gods. They are musicians whose breath is naturally colored with music. As soon as they put their instrument to their lips – whether it is a saxophone, a trumpet, a flute or a harmonica – the music is there, right away, guileless and inescapable. Like a truth that immediately plunges the listener into a state of weightlessness with the sheer honesty of its inner voice. This lyrical endowment is called charm. Lester Young, Miles Davis, Chet Baker, Stan Getz and a few others have succeeded in harnessing this gift, which transforms breath into “something blue that appeared like a wing” (Victor Hugo). Olivier Ker Ourio definitely belongs to this clan of the chosen. For the Jazz harmonica world, Toots Thielemans, the man who transformed this toy instrument into an essential voice in Jazz and Cinema (just remember “The Getaway”, by Sam Peckinpah in 1972), is still the main figure. With his seventh album since 1998, Magic Tree, Olivier Ker Ourio gets to shine in his own light, breathing calmly in his harmonica as on a summer night. The light is soft, the son of Reunion Island climbed the magic tree of his childhood and looks at the sunset over Saint-Denis in Reunion Island. He dreams. And he has ideal partners: Emmanuel Bex, who mixes warmly the sounds of his Hammond organ with the sometimes very close mouth organ sounds; Philip Catherine, the one and only, king of melody; André Ceccarelli who discreetly anchors the boat. 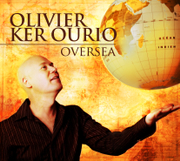 All Olivier’s original compositions swing with island rythms: calypso, habanera, cachucha, maloya…, that the Jazz critic will uneasily identify, while Olivier Ker Ourio euphorically improvises with generous lyricism. It is easy to understand why so many great musicians, from Michel Petrucciani to Ralph Towner, from George Moustaki to Michel Legrand, from Aldo Romano to Rick Margitza, insisted to play with him: he breaths with the soul. In Europe, the name Olivier Ker Ourio is synonymous with the kind of the artistic groundbreaking music Pat Metheny is known for here. It’s fresh, it’s beautiful and will turn you into a Ker Ourio fan for life. His albums are a musical journey, bearing no resemblance to other paths your ears have trodden …he is unique… the real thing. I host a Chromatic Harmonica website, MASTERSOFHARMONICA.COM, and this genius’s music has been like finding a field of platinum diamonds in Noah’s ark full to the brim…he will take you someplace…a place you have not been, and the life of music will come alive anew for you. I am sure you will love it, and you will be a Ker Ourio fan for life. France, Belgium, Holland, Denmark, Germany, Switzerland, Ireland, England, Spain, Portugal, Italiy, Corsica, Greece, Turkey, Bulgaria, Serbia, Ukraine, Russia, Algeria, Togo, Benin, Ghana, Bahrein, United-States, Brazil, Venezuela, Mexico, and the islands of Reunion, Mauritius, Guadeloupe, Madagascar, and Mayotte.